BASIC SETTINGS FOR BLOG OR YOUR WEBSITE. 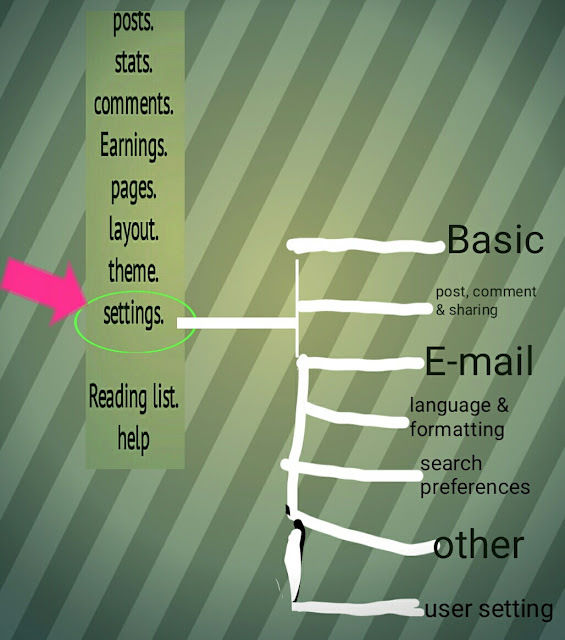 Today I am going to discuss step by step about the basic settings for blogger blog. If you are blogger and want to know about how to do the all the basic settings of your blog or website in blogger then you are at right place. Follow the given below steps. 1) sign in to blogger.com using your Google account.if you do not have Google account then you can create it easily. 2) when you will sign in at the left side there will be a setting option.as shown below figure. The below figure is only used to explain how it will look when you will click on settings. 3) click on the settings the different options will come as shown in above figure. Now I will tell you step by step about each settings in blogger. ￫Basic- this is the basic setting of your blog. blog description​- you have to add description of your blog in this section. Privarcy- in this section you have to tick on yes on both as it describes that your blog is visible to search engine & is in blogger list. HTTPS setting- you have to just click yes under this setting as your blog when viewed by people it will be in HTTPS secure connection. Blogger provide free HTTPS for blogs & also for custom domain. ￫Post, comment & sharing- this section provides you about how much post you want to show in your main home page You can select it, & it includes basic comments setting for your blog that your choice whether you want to do comments setting or not. ￫E-mail- you can place different e-mails by just separate​ by comma. This is basic email settings which you can do for your blog. ￫Language & formatting- in this section you can change your blog language. & Also the date, time according to your country. Also you can use translator in your blog. ￫Search prefrences- this is the most important section as it is S.E.O(search engine optimization) setting of your blog. Step by step I will tell you about each setting. Meta description- it is the tags or keyword of your blog.you have to write the very small description about your blog under 150words.you can use words separate by comma. You can add robot.txt & custom robot head text to your blog. Remember that this is an very important setting for your blog or website as you are telling to search engine that what pages & posts you have to index or have not to index . Means search engine will only show that content or posts which you want to like to appear on search engine. First go to SETTING➡️SEARCH PREFRENCE ➡️ go to custom Robot head text. You have to enable so click on yes to enable under this there will be options avaliable so for that follow the below given instructions. In that tick only on the all option don't tick another given option only tick on all. In that tick on noindex & noarchive leave other option only tick on noindex & noarchive. In this tick on all & leave other option. And after that just click on save changes. ￫Other- in this section you can delete your blog, can manage your video, and can also add Google analytics web property ID for your blog. ￫User settings- in this section you can add your profile as there are two option given in this section from which you have to select any one profile for your blog. It's your choice which profile you have to select for your blog. It may be your blogger or Google+ profile & along with this you can set language. Permalink setting for blog- this option is avaliable at the right side when you are writing your blog it will appear on right side.you can set the permalink for your blog. Automatic permalink- this link will be automatically generated you have to do nothing. But if you want your custom permalink than just click on custom under permalink and set it which you want & press on done button. You can set your permalink it is according to your title which you have put for your blog. Ex- as my title is Blogging basic setting. You can set custom permalink as Blogging-basic-setting. Add labels- to add labels or tags in your blog just click on the top right side where you are writing your blog. Under that you can write tags or labels separated by comma. In this you have to just write labels which are related to your blog post. I hope this will help for beginners.